Here are some more pictures of my "Sleeping beauty". She is wearing her under shorts I've made this morning and I will now be working on her dress. She will have a very pale yellow dress in silk. My "Sleeping beauty" is now ready to be strung! 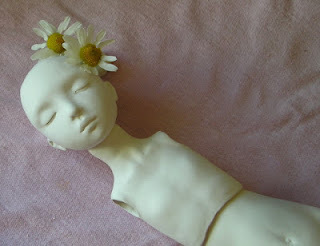 This week I will work on polymer lining her joints and will put her together - very excited! She will be very similar to my previous prototype but will have small changes as well as double jointed knees. I made the top of her torso a little thinner then in my "Red Riding Hood's" prototype. This one I am working on will be a "Sleeping Beauty", right now I have the parts out of the mold and will be cleaning them up, next then the first stage of kiln firing. Did you notice - the face is rather wider then in my previous girls :) .